Fewer than ten grizzlies remain in the North Cascades—they need recovery action! In 2014, the National Park Service, the U.S. Fish and Wildlife Service and the Washington Department of Fish and Wildlife began a new, multi-year Environmental Impact Statement planning process for restoring a healthy grizzly bear (ursus arctos) population in Washington’s North Cascades Ecosystem. 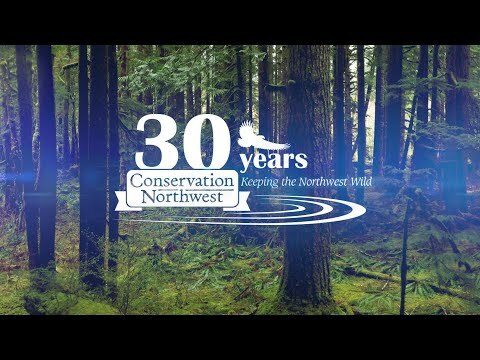 These endangered Northwest natives need your support! Visit our Friends of the North Cascades Grizzly Bear website to take action at: www.northcascadesgrizzly.org. Grizzly bears have been an important part of the North Cascades Ecosystem for thousands of years. They play a vital role for the health of the environment and other wildlife species, figure prominently in regional Native American and First Nations’ cultures, and contribute to the richness of our natural heritage in the Pacific Northwest. Now is the time to restore a healthy grizzly bear population in the North Cascades. “Public planning to restore a healthy grizzly bear population to the high-quality habitat of the North Cascades Ecosystem marks the potential turning point in the decades-long decline of the last grizzly bears remaining on the U.S. West Coast. Without active recovery efforts, these bears may soon be gone forever.”– Joe Scott, International Conservation Director, Conservation Northwest. Read more from Joe in this joint Op-Ed in The Everett Herald. A Chris Morgan Wildlife / Wildlife Media Production. More information at www.timeforthegrizzly.org. Recovery plans have been in place for grizzly bears in the North Cascades since 1997, and there’s little time for further delay. Fewer than ten grizzlies remain in this ecosystem that sprawls across 9,800 square miles of rugged country, anchored by North Cascades National Park. This transboundary landscape stretches into British Columbia, where another 3,800 square miles of high-quality grizzly bear habitat exists, anchored by Manning Provincial Park. Mostly undeveloped backcountry, together it’s an area significantly larger than the Greater Yellowstone Ecosystem where more than 700 grizzlies now reside. Isolated from other grizzly populations in Canada and the Northern Rockies by geography and development, but with excellent bear habitat and abundant food sources still available, the North Cascades grizzly population needs restoration action or the Great Bear will soon disappear from a landscape it has roamed for more than 20,000 years. Given their isolation, the low number of existing grizzly bears, their very slow reproductive rate and other constraints, the North Cascades grizzly bear population is considered the most at-risk bear population in the United States today. We coordinate the Friends of the North Cascades Grizzly Bear, an independent and informal partnership supporting the restoration of a healthy and functioning grizzly bear population in the North Cascades Ecosystem. Learn more at www.northcascadesgrizzly.org. Supportive resolutions, testimonials, frequently asked questions, resources and helpful links, bear safety information, and more are available on the website. More than two dozen Supporting Organizations and Businesses and over 2,000 Supporting Individuals have already signed on as Friends of the North Cascades Grizzly Bear. Steering Committee organizations for this collaborative effort include Conservation Northwest, National Parks Conservation Association, Woodland Park Zoo, Defenders of Wildlife, Northwest Trek Wildlife Park and the National Wildlife Federation. In the past decade, multiple polls and public comment periods have reflected strong public support for North Cascades grizzly bear restoration that transcends geographic and demographic lines. Washingtonians largely agree that preventing the extirpation of this iconic native species is important for our natural and cultural heritage. More than 127,000 public comments were submitted on a draft Environmental Impact Statement in early 2017, the vast majority of them supportive of recovery. During a 2015 public comment period, of those who submitted comments in support of or opposition to grizzly bear restoration, supporters outweighed opponents by over 5 to 1! During 2016 polling of Washington residents, more than 80 percent of respondents across geographic and partisan lines agreed that grizzly bears are important, and should be restored in the wilderness of the North Cascades where quality habitat remains. The research found that voters support efforts to help the population in the North Cascades recover, and believe that those efforts should be science-based and led by expert biologists. 86% agree with the following statement: Grizzly bears in the North Cascades Mountains should be preserved for future generations. Moving testimonials from Native American leaders, scientists, hikers, conservationists, sportsmen, rural community members and other Washingtonians also point to the vital need to save the North Cascades grizzly bear. “There hasn’t been a permanently closed trail or area in the Greater Yellowstone Ecosystem in 40 years because of grizzly bears.” – Kim Barber, senior grizzly bear biologist, Shoshone National Forest. The North Cascades has been managed as a home for grizzly bears since 1997, with fewer than ten grizzly bears present in the ecosystem today. Because this place is already managed as a federally-designated Grizzly Bear Recovery Zone (GBRZ), if restoration actions do go forward, little would change regarding the management of trails, campsites, roads and outdoor recreation on this landscape. Visitors to the North Cascades should already be taking bear-aware precautions, and resources are available to learn about how to live, work and play in bear country. Read more on grizzly bears and outdoor recreation from hiking-guidebook author Craig Romano! The Shoshone National Forest in Wyoming has one of the highest densities of grizzly bears in the Lower 48. Even with a population of several hundred bears there, persistent access closures are almost nonexistent and dangerous encounters between humans and grizzly bears are exceedingly rare. While there are occasionally temporary grizzly-related closures, these are usually the result of food-related considerations. With education and awareness, steps to live and recreate safely in grizzly country become commonplace. North Cascades National Park already requires visitors to keep their camps bear-safe by using bear-resistant trash receptacles, bear canisters, or by hanging food, trash and other fragrant items at least ten feet off the ground and more than 100 yards from tents or sleeping areas. The return of a self-sustaining population of grizzly bears to the North Cascades would bode well for the ecosystem. An ecosystem capable of supporting grizzly bears—complete with healthy vegetation and prey populations, and secure habitat—is also capable of supporting the other species that call this ecosystem home. As the agencies move forward with the EIS process, conservation and recreation communities will be actively engaged to ensure this process is led by the best science, stakeholder and citizen input, and the deeply-held value of Washingtonians that grizzly bears deserve a place in our wild North Cascades for many generations to come. Why Do We Need Grizzly Bears? Grizzly bears are culturally and spiritually significant to First Nations throughout the Pacific Northwest and British Columbia. Grizzlies are seen as teachers, guides and symbols of strength and wisdom to indigenous peoples. They are a regional icon and a key part of our natural heritage. Grizzly bears are considered an “umbrella” species, and they play an important role for healthy ecosystems. Habitat that supports grizzly bears also supports hundreds of other plants and animals and human needs, like clean water, healthy forests and quality outdoor opportunities. Grizzly bears have been part of the Pacific Northwest landscape for thousands of years. We have an ethical and legal obligation to restore this native species. Grizzly bear recovery in the North Cascades is an important part of national efforts to restore endangered animals where suitable habitat still exists. Why Grizzly Bears in the North Cascades? Grizzly bears have coexisted with people in the North Cascades Ecosystem from when the first people arrived in North America. This changed during the 19th century with the boom in the fur trade. Nearly 3,800 grizzly bear hides were shipped out of area forts during one 25-year period. The U.S. Fish and Wildlife Service has designated the North Cascades Ecosystem as one of six Grizzly Bear Recovery Zones (GBRZ), wild areas where there is abundant quality habitat to support viable grizzly populations as part of a national strategy to recover grizzly bears in the lower 48 states. The public lands within the North Cascades GBRZ are already managed to maintain critical grizzly bear habitat and allow for grizzly bear recovery. Approximately 41 percent of the area is protected as national park lands or designated wilderness with limited motorized access. Adjacent to North Cascades National Park is B.C.’s Manning Provincial Park, which provides additional quality grizzly bear habitat. Grizzly bears are at a high risk of extirpation, or going locally extinct, in the North Cascades. Restoring a self-sustaining population would contribute to the restoration of biodiversity in the ecosystem for the benefit and enjoyment of present and future generations.